Sometimes I have the opportunity to sing and create with kids in a school for a whole week and it is always such a treat! Classes will often create beautiful friendship posters portraying friendship and happiness and stewardship of our fragile planet. Many beautiful cooperative poems were composed for me to set to music. Normally I ask one of the students to read their class poem and ask how they might hear it as a song: slow.. fast...ballad...rock and roll.. country...etc. Then I simply sing it into a song..but more from my heart than from my brain...more like a bird might welcome morning light. One of the memories I cherish from the Libby School was when one afternoon...... we were discussing how a song "happens" and a student said " I just start out with singing 'bip bop...bip bop' over and over again until words and music pop out " So we all started singing "bip bop...bip bop..bip bop" and it became a happy song all it's own! I believe we all have songs in each of us..just waiting for something or someone to give us the freedom/ permission to be our creative selves! It's so simple~ bip bop...bip bop! Jim Valley spent a week in my school. Each student participated in a large group assembly. Each classroom participated in a small group workshop. We all benefitted from Jim’s culturally and ecologically conscience messages, but it was the change in student attitudes and their increased feelings of friendship and support for each other that pleased me the most. 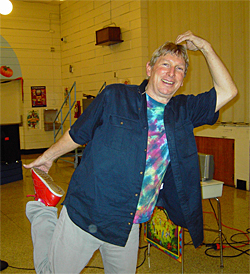 Through his charismatic style of storytelling, integrated with his musical talent, I watched Jim Valley captivate my students, as he focused on treating all living things, including Planet Earth, with kindness, care and respect. 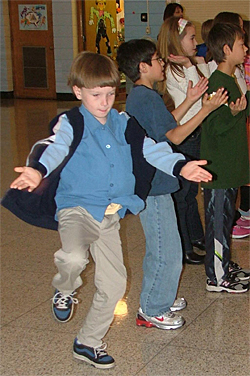 Through song, dance and a whole lot of fun, it became a magical week at Libby Center for students and staff. By Friday, everyone was very sad to see Jim Valley leave. However, the feelings of friendship and caring for one another in our school lingered much longer than Jim's visit. Both primary and intermediate students love Jim Valley. Parents and teachers love him, too. There is truly something special about this Rainbow Planet guy……and his ability to bring out the fun-loving child in all of us. Bring him to your school. Whether for one day or a week, it will be time well spent for all, with long lasting results for your school.